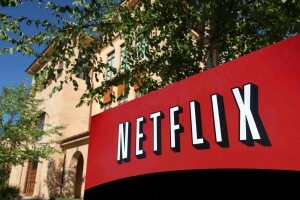 Most Netflix, Inc. (NASDAQ:NFLX) investors will be overjoyed this week after the stock rose as much as 25% on Tuesday morning, following an earnings beat on Monday. However, in the midst of this euphoria, it may be useful to take a step back and consider whether the stock’s gains will hold. After all, Netflix, Inc. (NASDAQ:NFLX) stock has crashed more than 50% on two separate occasions in the last two years. 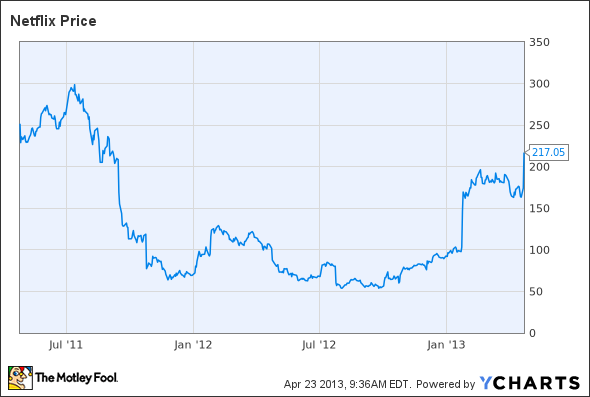 Netflix 2-Year Price Chart, data by YCharts. While Netflix has a strong position in the online subscription video market, there are several reasons Netflix’s gains may not last. Netflix beat most analysts’ estimates with adjusted EPS of $0.31 last quarter, but the company still faces some major challenges (as does the stock). Netflix, Inc. (NASDAQ:NFLX) may have earned an accounting profit last quarter, but it didn’t actually make any money. Free cash flow, which measures the amount of cash left over for investors after paying for operating costs and capital expenditures, was negative for the third consecutive quarter. Moreover, management told investors to expect FCF to continue lagging net income for the foreseeable future as the company invests in new original content. These investments may be necessary for Netflix, but cash costs cannot sustainably exceed revenue. Additionally, today’s cash costs must eventually be reflected in Netflix, Inc. (NASDAQ:NFLX)’s accounting statements, implying that the company’s costs will rise significantly in the next few years. If Netflix can keep the subscriber base growing quickly, it may be able to overcome these cost increases. On the other hand, if subscriber growth starts to lose momentum in the next few years, the company may never reach the profitability levels investors expect. Not surprisingly, the entry of Amazon.com, Inc. (NASDAQ:AMZN) and Hulu into the online subscription video market is starting to drive up content costs. Amazon.com, Inc. (NASDAQ:AMZN) has been particularly aggressive in buying content; it has more than doubled the size of its Prime Instant Video content library in the last year. Amazon.com, Inc. (NASDAQ:AMZN) is also in the market for original content. In the short term, this competition could boost Netflix’s profitability, if the company adds less content because competitors are outbidding it. Netflix specifically stated in its shareholder letter this quarter that it is moving toward “curated” content and will not renew nonexclusive bulk content deals (i.e., Netflix will focus on quality rather than quantity). This could help Netflix to keep cost growth in check as it spends heavily on exclusive content. However, longer-term, the paring down of Netflix’s streaming content library could cause some users to try Prime Instant Video, since Amazon seems more interested in maximizing the amount of content available. 3. TV network or media conglomerate? One of the major reasons for the volatility of Netflix, Inc. (NASDAQ:NFLX)‘s stock for the past two years is that earnings have been beaten down by start-up costs for international markets, as well as the de-emphasis of the DVD-by-mail business. While Netflix has earned approximately $0.68 per share in the past year, it had earned nearly $4 a share in the 12 months prior to June 30, 2011. Rather than valuing Netflix based on earnings, investors have tried to value Netflix’s business by comparison to similar companies.